The divine comedies were written by Dante in the early part of the 14th Century. They are comprised of 3 volumes; Inferno (Hell), Purgatorio (Purgatory), and Paradiso (Heaven). I had long since wanted to read them but I do admit it was only after the videogame Dante's Inferno was released that I got around to buying the books. I can't help but compare the book to the game in my review, will attempt to keep that to a minimum! Hell starts with Dante lost in a dark forest. He attempts to climb a large mountain but is stopped by several ferocious animals. Amidst his despair Virgil; a long dead poet appears, he tells Dante that to climb the mountain (which is actually Mount Purgatory) he is going to have to go around it which involves a voyage all the way through Hell. Virgil offers to guide Dante and ensure that no evil will befall him so that he can get to the mountain and from there get to Paridiso where his dead love Beatrice resides. 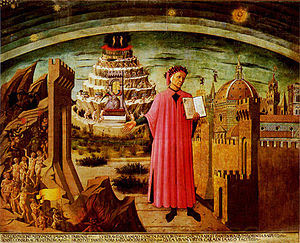 The Hell Dante describes is the Christian view of Hell at the time. It is made up of 9 circles, each dealing with a different sin. Hell stretches all the way down to the centre of the Earth. At first it seemed all a bit rushed, Dante passing from circle to circle quite rapidly, but the later circles are far more hard going and take up around half the journey. Lots of monsters, demons and damned souls are encountered along the way. Many tortures are described as Dante descends. From the circle of Lust where souls are forever swept around by a giant wind to a boiling river where the wrathful are forced to reside. Descriptions are often quite good at giving a vivid view of what the locations look like. The woods of suicide where the trees are all people who had killed themselves, the giant burning desert where people who committed sins against God and nature are forced to either be buried in the scolding sands, or forced to forever run, where it rains eternal fire. The most enjoyable circle to read about was the 8 bowges of fraud, each one had a different punishment for a different type of fraud, one where everyone's heads were twisted completely around (fortune tellers now forced to forever look backwards), another one where the damned were forced to wear brightly coloured metal robes (the hypocrites) and a nasty one where souls were forced to reside submerged in a lake of boiling pitch, demons would stab them with spears if they dared show their heads above the surface. At first I couldn't help but draw comparisons between the videogame and the book, familiar characters were mentioned that I recalled as bosses in the game, and the locations were at times similar. As Hell goes on though the comparisons fade away, the later half is completely different to the game and it has to be said a lot better. 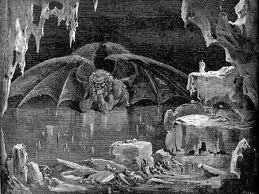 In Dante's poem Satan (known here as Dis) is not some evil master of Hell, instead he is a victim the same as everyone else, impossibly huge he is encased in ice at the very bottom gnawing on Judas, Brutus and Cassius. 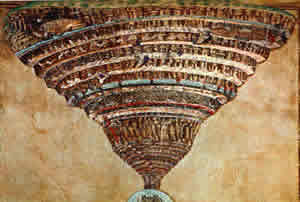 Dante and Virgil climb down him (and then in a neat twist due to gravity reversing they then climb up him) to escape Hell. 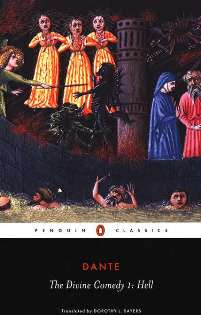 The version of The Divine Comedy I read was translated by Dorothy Sayers in 1949. It starts with a 70 page introduction that explains the background of the time Dante lived in. Turns out many of the people he encounters in Hell are real people he knew in life, both enemies and friends (Dante had a exciting life, he was involved in battles, and was exiled from his home town). This part of the book was really quite dry and boring to be honest. The poem itself is far better. Split into Cantos each one starts with a description by Sayers of what happens which is quite useful, and ends with some descriptions of the various themes and people looked at. The last part of the book is a large glossary that I skipped past. A great tale, a classic for all time, just let down slightly by the droning introduction. Really left me wanting to see what happens next in the further two volumes.